After Hawthorne’s and Sophia’s wedding ceremony at the house of Sophia’s parents in Boston on July 9, 1842, Hawthorne and his bride moved into the Old Manse in Concord, rented from Emerson. Thoreau had planted a vegetable garden next to the house as a wedding present. At the Old Manse today is a re-creation of this garden based on the journals of Hawthorne and George Bradford. During the time Hawthorne and his family resided in Concord, he and Thoreau, a close neighbor, became good friends. As Buford Jones explains in his article “’The Hall of Fantasy’ and the Early Hawthorne-Thoreau Relationship,” Hawthorne admired the literary work of his neighbor and praised him in print; moreover, as Jones points out, Thoreau’s “conversations with Hawthorne, as Frank Davidson has convincingly demonstrated, helped shape several of the tales and sketches in Mosses from an Old Manse (1846) including ‘Egotism; Or, The Bosom Serpent,’ ‘The Celestial Railroad,’ ‘Earth’s Holocaust,’ ‘Fire-Worship,’ and ‘Buds and Bird Voices” (1429). 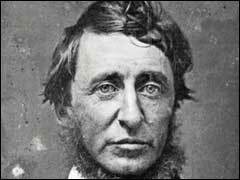 He also, Brenda Wineapple points out, praised Thoreau’s “scholarship; his good sense; the way he handled his skiff” (165). In Concord, Hawthorne and Thoreau both spent time with Margaret Fuller when she was a guest in the Emerson household. At that time Thoreau was living with the Emerson’s as a hired hand. On a later visit to Concord, John Matteson writes, Fuller “was stirred from sleep before sunrise by the hoarse voice of Thoreau, who stood beneath her window and proposed a boat ride on the river. They drifted for two lazy hours under the early morning sun” (254). Matteson adds that Fuller “was even more delighted to spend ten days at the Old Manse with Nathaniel and Sophia Hawthorne” though, as Matteson explains, Hawthorne “had wisely kept his less kindly opinions of Fuller to himself…” (254). After word came to Concord on July 22, 1850 that Margaret Fuller had died in a shipwreck of the Elizabeth off Fire Island, along with her Italian husband and son, Emerson sent Thoreau to Fire Island to search for her body and for any sign of her manuscripts or personal effects. Thoreau arrived on Fire Island on July 24, but he found no traces of Fuller. Scavengers, who had arrived at the time of the wreck, had made off with the remains of cargo and personal property that had washed up on shore from the ship by the time Thoreau arrived. John Matteson explains that Thoreau did, however, find at some distance away, a jacket which belonged to Fuller’s husband, Giovanni Ossoli, and he “ripped a button from the garment and put it in his pocket,” later writing to a friend “that Ossoli’s button was ‘an actual button so called—And yet all the life it is connected with is less substantial to me than my faintest dreams.’ With acute melancholy, he added, ‘Our thoughts are the epochs in our lives: all else is but as a journal of the winds that blew while we were here’” (423). John Matteson adds that Charles Davis, an Englishman and first mate on the ship, told Thoreau, “’If it had been the coast of England, they could all have been saved.’ But the ragtag Americans [those at the lighthouse nearby and the men onshore] remained immovable” (421). In 1847 Hawthorne moved his family from Concord back to Salem where they lived with his sisters and mother at 18 Chestnut Street; two months later they moved to larger quarters at 14 Mall Street. In 1848, Hawthorne became manager of the Lyceum of Salem and invited Emerson and Thoreau to lecture. In May of 1864, Hawthorne travelled to New Hampshire with Franklin Pierce. It was on this trip on May 18/19 that Hawthorne died in his sleep. He is buried in Sleepy Hollow Cemetery in Concord, MA near Emerson and Thoreau along what is now known as Author's Ridge. Hawthorne, Nathaniel. American Notebooks. http://www.eldritchpress.org/nh/pfanb01.html Accessed 30 Aug, 2016. Jones, Buford. “’The Hall of Fantasy’ and the Early Hawthorne-Thoreau Relationship.” PMLA, vol. 83, No. 5, 1968, pp. 1429-1438, https://www.jstor.org/stable/1261316?seq=1#page_scan_tab_contents. Accessed 30 Aug. 2015. Matteson, John. The Lives of Margaret Fuller. NYC: W.W. Norton, 2012. Wineapple, Brenda. Hawthorne: A Life. NYC: Knopf. 2003.